Sunday, NSC adviser John Bolton spoke of a "Libyan model" for the North's disarmament, referring to Moammar Gadhafi's surrender of all his weapons of mass destruction in 2004. The U.S. was invited into Libya to pick them up and cart them off, whereupon sanctions were lifted. As Libya was subsequently attacked by NATO and Gadhafi lynched, North Korea denounced Bolton and all this talk of the "Libyan model" of unilateral disarmament. If we expected Kim to commit at Singapore to Bolton's demand for "complete, verifiable and irreversible denuclearization," and a swift follow-through, we were deluding ourselves. He is likely to offer an end to the testing of nuclear weapons and long-range missiles, no transfer of nuclear weapons or strategic missiles to third powers, a drawdown of troops on the DMZ, and the opening of North Korea's borders to trade and travel. As for his nuclear weapons and the facilities to produce them, these are Kim's crown jewels. These brought him to the attention of the world and the Americans to the table. These are why President Trump is flying 10,000 miles to meet and talk with him. And, unlike Gadhafi, Kim is not going to give them up. 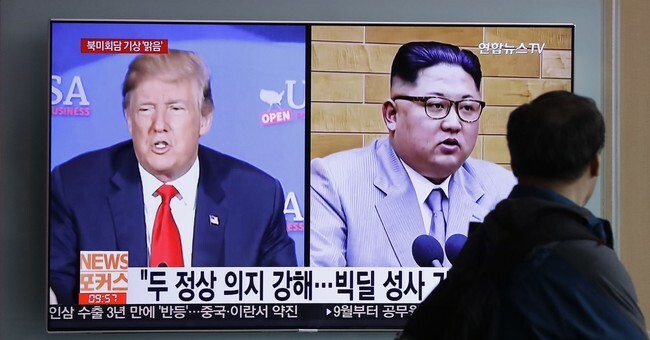 Assuming the summit comes off June 12, this is the reality Trump will face in Singapore: a North Korea willing to halt the testing of nukes and ICBMs and to engage diplomatically and economically. As for having Americans come into his country, pick up his nuclear weapons, remove them and begin intrusive inspections to ensure he has neither nuclear bombs nor the means to produce, deliver or hide them, that would be tantamount to a surrender by Kim. Trump is not going to get that. And if he adopts a Bolton policy of "all or nothing," he is likely to get nothing at all. Yet, thanks to Trump's threats and refusal to accept a "frozen conflict" on the Korean peninsula, the makings of a real deal are present, if Trump does not make the perfect the enemy of the good. For there is nothing North Korea is likely to demand that cannot be granted, as long as the security of South Korea is assured to the degree that it can be assured, while living alongside a nuclear-armed North. Hence, when Kim cavils or balks in Singapore, as he almost surely will, at any demand for a pre-emptive surrender of his nuclear arsenal, Trump should have a fallback position. If we cannot have everything we want, what can we live with? Moreover, while we are running a risk today, an intransigent North Korea that walks out would be running a risk as well. A collapse in talks between Kim and the United States and Kim and South Korea would raise the possibility that he and his Chinese patrons could face an East Asia Cold War where South Korea and Japan also have acquired nuclear weapons and the means to deliver them. In the last analysis, the United States should be willing to accept both the concessions to the North that the South is willing to make and the risks from the North that the South is willing to take. For, ultimately, they are the one who are going to have to live on the same peninsula with Kim and his nukes. Trump ran on a foreign policy that may fairly be described as a Trump Doctrine: In the post-post-Cold War era, the United States will start looking out for America first. This does not mean isolationism or the abandonment of our allies. It does mean a review and reassessment of all the guarantees we have issued to go to war on behalf of other countries, and the eventual transfer of responsibility for the defense of our friends over to our friends. In the future, the U.S. will stop futilely imploring allies to do more for their own defense and will begin telling them that their defense is primarily their own responsibility. Our allies must cease to be our dependents.